Walked past an unopened “fun-size” candy bar in the parking lot on the way home this afternoon. Assumed that someone was bummed that they didn’t get to enjoy it. 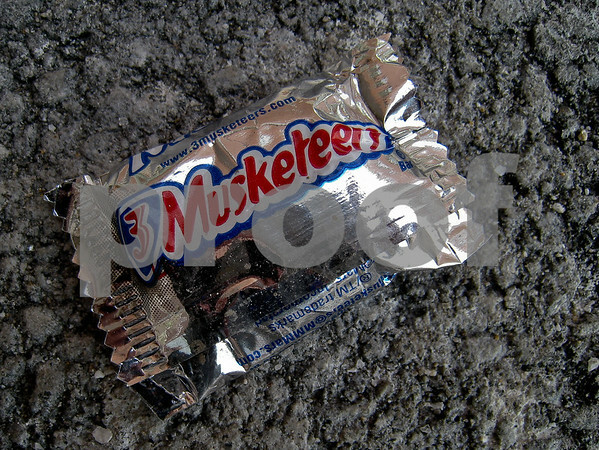 * A standard size 3 Musketeers bar (60g) has 257 calories, 5 grams of saturated fat, and 40 grams of sugar. Yes, I am aware that this is a really random picture. However, it amused me. Update: As of this morning, it was still sitting there. I didn't have the heart to pick it up. I'd be crying, too, if I would've lost this .... wonderful "random" shot, and love all the info you shared!